When Lin Hsin-Chen proposed the line challenge, I was stumped. I think there were just too many possibilities for me to easily settle on a single design. I photographed a wide variety of linear inspirations ranging from tire treads to the construction of a native indian Chickee (aka Tiki Hut). I imagined scientific depictions of elements and DNA, and envisioned creating a similar model to represent some decision making process (perhaps the challenge of design?). As I mentioned in my prior blog post, the weeks passed and I still had no direction. I think the turning point was when I chose to interpret line as a method rather than a subject. Specifically, I decided to focus on thread and stitch. Once my “line” decision had been made, I was free to choose any subject. I chose an eye for two reasons. The first: I love circles and frequently doodle in curves and arcing shapes. 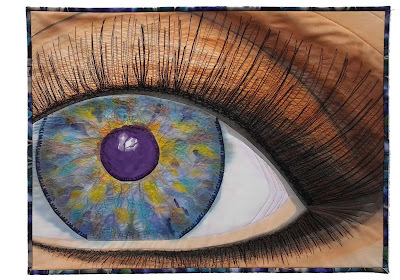 Secondly, the iris is like a fingerprint, unique to each individual. 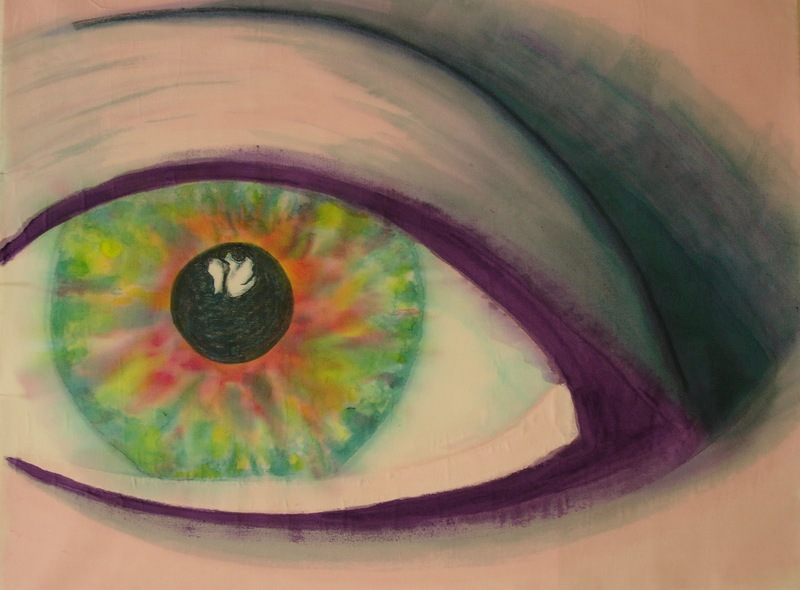 I thought depicting an eye would be an interesting analog to the linear representation of a fingerprint. In retrospect, there was probably a third reason: the harmony (or irony?) of using an eye to communicate my vision. “Beauty Is…” is a whole cloth quilt, created with Setacolor fabric paints and then thread painted with a variety of cotton, rayon, polyester and metallic threads. Despite my late start, I had so much fun with this challenge that I actually painted two different eyes. I am looking forward to finishing the second one soon! I like the way you solved the problem of too many possibilities by thinking of the line in a different way. Great idea! Fiber art depends so much on stitched lines, in construction and also as an element of design. Here you've incorporated the drawn/painted line as well. Nice work! Very nice, indeed....and an interesting solution. AND, I might paraphrase the same question 'your husband' asked of Kate. How did you do it in less than two months?! I REALLy like that you combined painting and thread to depict your vision. Diane, I was having so much fun that I couldn't stop! Once I had the idea, the quilt came together quickly. Unlike Kate, that isn't typical for me :) Hurrah for the power of enthusiasm! That's great, Lisa-Marie! I like the idea that you went in a totally different direction with this - part of what I love about the group is watching people's talents/personalities/proclivities unfold as we go through each new challenge. Will you do a brown one? Yes! I plan to piece the brown one rather than paint it. I have to agree that sometimes the hardest part of the challenges is narrowing down the possibilities. I think of 'eye line' when I see your piece Lisa-Marie. I saw the piece "in progress", and was blown away, but the finished product is astounding. Love it!